California resident Mark Towle runs car customizing shop Gotham Garage, which makes replicas of cars from TVs and movies. Naturally, Batmobiles were on the menu, at least until Warner Bros. smacked Towle with a lawsuit for violating its intellectual property. Now a U.S. District Court Judge Ronald Lew judge has ruled that the Batmobile is subject to copyright because the Batmobile is itself a fictional character in the Batman franchise. The Hollywood Reporter, which broke the story, has posted U.S. District Court Judge Ronald Lew's opinion on the case of DC Comics v. Mark Towle. Under normal circumstances, vehicles are subject to patents, with utility patents (on inventions that improve the functioning of a car, for example) lasting 20 years from the date of application and design patents (on the design of individual parts) lasting 14 years. But DC's suit alleged that Towle was in violation of its trademarks and copyrights. 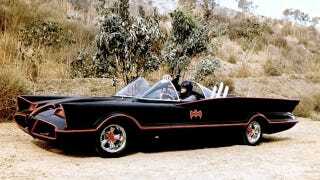 Lew ruled that, in making and selling Batmobiles, Towle violated DC's copyright on the character of the Batmobile. Content owners are granted a copyright not just in text and artwork, but also in literary characters if the character constitutes "the story being told." For example, a character who is a generic superspy doesn't infringe upon the character of James Bond, but if your superspy is British, wears a tux, and drinks his vodka martinis shaken, chances are that you're in violation. The generic superspy is not a copyrightable character, but James Bond is. But is a non-sentient car a character? Lew cited an earlier case, Halicki Films LLC, v. Sanderson Sales and Mktg. et al., which investigated whether or not the "Eleanor" car in the 1974 film Gone in 60 Seconds was a copyrightable character. Although the Ninth Circuit did not resolve whether Eleanor was herself copyrightable, the discussion of the case indicates that a plain old non-sentient vehicle is not necessarily excluded from character copyright protection as long as it fulfills the other requirements of a character copyright. And, in Lew's analysis, the Batmobile fulfills those requirements. Lew also finds that, even if it fails the character copyright test, the Batmobile would be copyrightable as a "pictorial, graphic, and sculptural work." But it's the discussion of the Batmobile as character that's the most interesting. It makes sense that, especially in graphic media, objects that we don't traditionally consider characters would be integral to the storytelling. You could have a perfectly engaging story that centers on the Batmobile, after all. If other courts uphold this case or cite it as persuasive law, it creates some questions about what constitutes a character in storytelling, and what constitutes a mere storytelling accessory.